I'm slowing getting used to the fact that the seasons have changed, and that I can no longer spend every free minute foraging. Fortunately, this has freed up some time for me to play in the kitchen. It's been a while since I've had enough time to roll with my creativity. Thankfully, the featured ingredient for the Wild Things foraging recipe challenge this month is acorn, which is providing me with lots of inspiration. As you might expect, acorn tastes rather nutty. But what makes it truly special is a dark molasses-like sweetness, at once delicate and rich. I've got about a zillion ideas about things to make with acorn meal. Hopefully I'll be able to try most of them. I suspect the real trick in working with acorn lies in not masking its special flavor. But really, that's true with all delicacies, isn't it? Today, I decided to take acorn to sweetsville, and use it in place of almond in a frangipane tart. The acorn frangipane filling is fluffy and lightly sweet, and plays well with seasonal fruit. I've used apples here, but use whichever fruit you enjoy, pears would be nice. Also, be sure to serve these tarts with a big scoop of either whipped or ice cream. Combine all dry ingredients. Cut in the butter until pieces are the size of small peas. Combine the egg, water, and vinegar, then add to the dry ingredients. Stir with a fork until the mixture starts to stick together, adding water one teaspoon at a time if the dough needs more moisture. Pull the dough into a flattened ball, wrap in plastic wrap, and refrigerate for one hour. Divide dough into four pieces. Roll each into a circle, 1/8" thick. 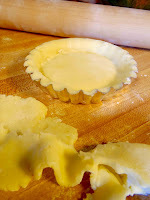 Gently press the pastry circles into four small tart pans, trimming any extra from the edge of the pans. Poke holes in the pastry with a fork, then bake in a 425 (F) oven for 10-12 minutes. Because I was winging it with the recipe, I ended up with extra pastry dough. But I happily wrapped it up and tucked it into the freezer to use another day. Combine all ingredients well, until the mixture is thick and creamy. 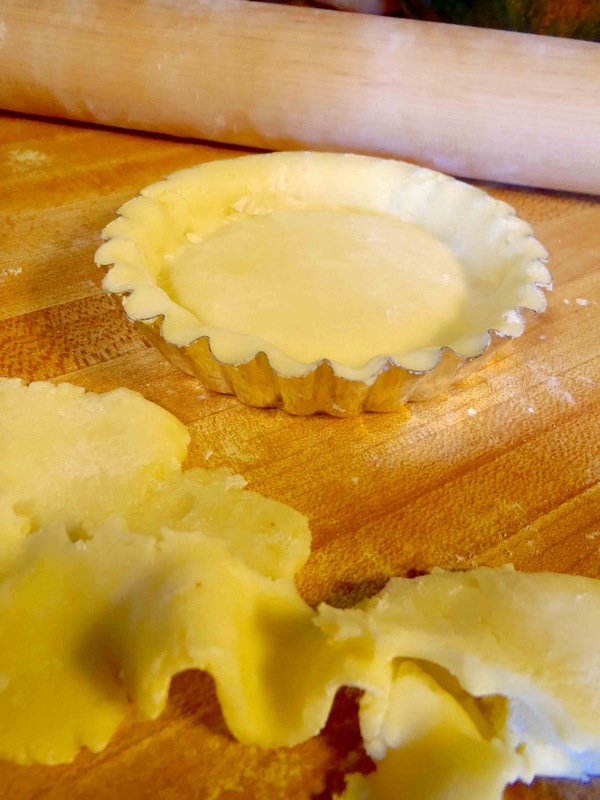 Fill pre-baked tart shells with acorn frangipane, stopping 1/8" below the rim of the tart, because the filling will puff slightly when baked. Peel, core, and thinly slice an apple. Fan out a few slices of apple on each tart, brush with butter, and sprinkle with a little sugar. Place the tarts on a sheet pan, and bake at 350 (F) for 40-45 minutes, or until the acorn frangipane puffs, and the fruit takes on a touch of brown. Heat 1 Tbsp. of whatever light-colored jelly/jam you have on hand, such as apricot or apple. Brush the fruit atop each tart with the melted jam to give it a bright shine. I'm pretty famous for not having a taste for sweets. But I find this recipe to be outstanding. I like the acorn frangipane so much that I intend to put a layer of it beneath the custard in my pumpkin pie this year. Are you ready to make something yummy with acorns? Send a link to your recipe to wildthings.roundup@gmail.com before the end of the month to see it included in the round up. I'm sharing this recipe with Fat Tuesday at Real Food Forager, the Hearth and Soul Hop, and Real Food Wednesday. I would never have thought of doing something like this with acorns in a million years. I think it's brilliant. Your tarts look beautiful! I love frangipane and how creative to use acorn flour to make it. I've never tasted acorns, but I can just imagine how delicious they taste! Thank you for sharing this recipe with the Hearth and Soul hop. Butter, you never cease to amaze me! Your ideas are ultra creative and you made it look so beautiful and the photography is amazing. I don't really have access to acorns here, but I think I'll be trying out your pastry dough! Thanks for linking up with the Hearth and Soul! Penny - you can substitute almond meal to made frangipane, which is how it is normally made. Just an update - I made the pie with acorn frangipane on the bottom and a simple pumpkin custard on top, and it was perfect. 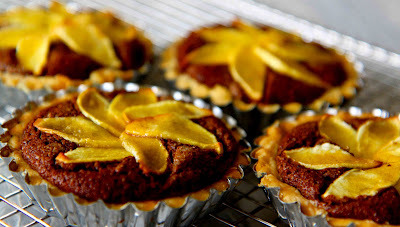 The acorn frangipane was actually a nice textural and flavor contrast to the pumpkin. Do you think I could make acorn flour in time for Thanksgiving? No, I don't think so. Not unless you are using one of the rare varieties that is very low in tannins.